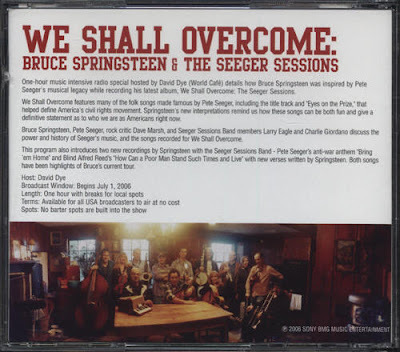 Continuing our series of radio specials, here's the hour-long documentary on the making of Bruce Springsteen's 2006 folk homage, We Shall Overcome: The Seeger Sessions . Thanks to springsteenlyrics.com for the scans I've borrowed of the packaging -- which, it should be noted, picture the 54-minute version produced for commercial radio; the special archived here is the 59-minute one made available to non-commerical stations, which consists of one track of the entire special, divided into segments with music breaks, followed by two promos for the program. Perhaps I'll substitute a scan of the appropriate cover when I have time. 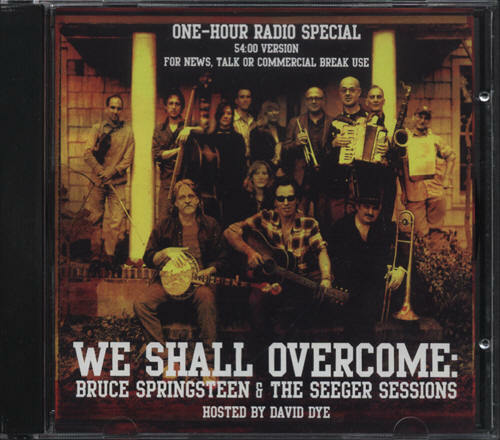 I hope Springsteen, Seeger and folk music fans find this both entertaining and informative. It's about time the Boss showed his face around here! Thanks for these radio docs (Springsteen and Dylan, so far). Although these types of things usually don't stand up to repeated listenings, they are almost always interesting and worthwhile to check out, and certainly worth the download. And they are usually stuff that we don't get the chance to hear on original broadcast. Thanks for making them available here. I'm a huge Bruce fan, and always enjoyed this. Thanks for sharing it with those who might not otherwise have had it. For those that can't get enough SSB, check out Flynn McClean's 7-disc tour compilation "Swing That Thing" which has highlights from shows throughout that tour. I'm pretty sure it is avail on the usual file sharing sites. Good stuff. I'm more a fan of the recordings of the 50's & 60's (and the original recordings of the 20's & 30's) but she'll be ecstatic over this. Thanks! Radio shows are a treat. thank u for these cool radio specials. i hope to listen to them with my brother when i visit him in El Paso. he and i are big fans of Bruce, Brian Wilson, Dylan and Sly Stone. should make good driving listening. Hey Pesky, that sounds great... have a nice visit and I hope you enjoy the shows! They do make for ideal car listening. Thanks, Looking forward to listening to this! Thanks PC. Wonderfully obscure posts that make my day.